Dear Bite Size Bible Study subscribers: My responsibilities with Bible Love Notes have been increasing the last few years, and I've felt the Lord telling me to cut back. Because of that, the study below will be my last "regular" Bite Size study. I may still publish from time to time, but without a set schedule. If any of you are not subscribers on Bible Love Notes, I encourage you to sign up for a subscription and receive a 1-minute devotion each weekday. (Sign up HERE). If that sounds like more than you want, just remember that you can read only those you want to read and they only take a minute! Also, I will be using extensive footnotes on some Bible Love Notes devotions that can serve as a short Bible study, if you like. A relative recently told me I'd offended her. I sincerely asked forgiveness. Afterward, I thought of the many ways that situation could have gone wrong if Biblical principles weren’t followed. 4. Are we prepared to forgive them as Jesus forgives us (Ephesians 4:32)? It's ungodly to ignore an apology or delay our response (Proverbs 3:27). 1. Are we apologizing or un-apologizing? 2. Are we demanding or asking for forgiveness? See He Apologized for an Affair. 1. What type of offenses should be overlooked? Proverbs 19:11: A person's wisdom yields patience; it is to one's glory to overlook an offense. 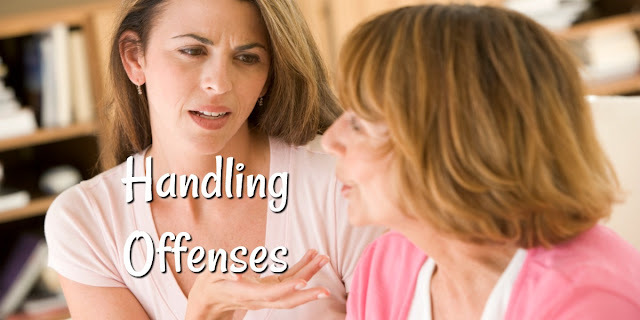 Is the offense part of an ongoing problem or simply a one-time mistake? Does the person need some extra grace because they're going through a difficult time in their life? 2. What does it mean to forgive others as God forgives us? Ephesians 4:29-32: Do not let any unwholesome talk come out of your mouths, but only what is helpful for building others up according to their needs, that it may benefit those who listen. 30 And do not grieve the Holy Spirit of God, with whom you were sealed for the day of redemption. 31 Get rid of all bitterness, rage and anger, brawling and slander, along with every form of malice. 32 Be kind and compassionate to one another, forgiving each other, just as in Christ God forgave you. Mark 11:25: And when you stand praying, if you hold anything against anyone, forgive them, so that your Father in heaven may forgive you your sins. I'm so glad you've enjoyed the studies. I was sad to have to stop doing them regularly too. God bless you. Thanks so much Raquel for your kind encouragement and your prayer. I'm so glad the studies have been helpful. My husband and I appreciate the time, effort, and messages you've shared. God loves you, and so do we. Thank you so much. That's such an encouragement.